40 Years and Growing! Since 1979, we have been a mission in your backyard serving a population of disabled adults who fall through the cracks of state assistance. It’s taken faith and this community to sustain our operation this long. Come Celebrate! 2019 marks 305 8th Street’s 40th Anniversary and the Love Keeps Growing On! 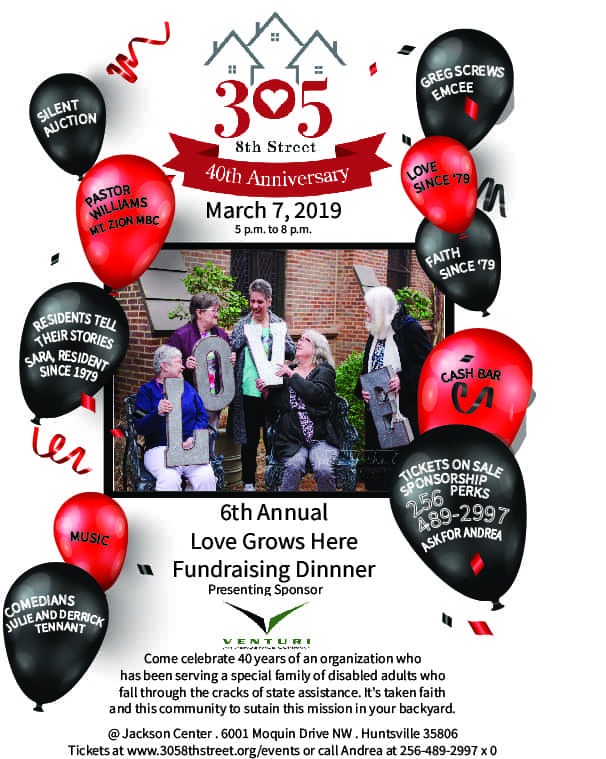 At the Annual Love Grows Here Fundraiser, we will have Greg Screws emcee, Derrick, and Julie Tennant tell some jokes and Andrea Williams shares some of the incredible histories of our residents and their stories March 7, 2019, at 5 p.m. The dress is business casual, we will have two cash bars, a silent auction, and some items to raffle. 305 8th Street, a nonprofit group home for disabled adults.